It is impossible and improper to venerate fictitious or imaginary characters. Just because someone painted an "icon" of that parable doesn't make it suitable for veneration. It is a didactic image, not an icon. There is nothing in Orthodox tradition which tells us who he was, and if he became a saint. Therefore, how is it possible or proper to venerate people who are characters in a teaching lesson, but were never real people, flesh and blood and soul? OTOH, the Samaritan woman who conversed with Christ at the well, and the woman with the issue of blood who was healed by touching the hem of Christ's garment, were not named in the scripture accounts in which they appear, but Orthodox tradition names them as Photeini/Svetlana and Veronica, and both are saints. In order to "venerate" the icon, you kiss it. Whom would you kiss here? The Pharisee or the tax collector....and why would you kiss them? While the tax collector is a good example of repentance, that we should emulate, he's hardly worthy of kissing and venerating. We only venerate and worship God....and His saints (only due to God's grace upon and working through them). Precisely, my dear Liza. Precisely. I guess I am not comfortable in lumping them all together as "schlock." When are you not wrong? Many Americans have so broaden the term schlock to render it almost meaningless. Frankly, I am not pleased when it is used synonymously with kitsch. Two words from Yiddish / German dialect meaning two different often very different things. Look up up Arnold Schoenberg's famous quote about kitsch and plain. Unusual, but not quite schlock. It's hard to tell if this was painted by an RC/BC or "True Orthodox" hand. If the former, it's on a par with the syncretistic schlock seen at the New Skete monastery; if the latter, yet another polemical, ecclesiopolitical statement. At least neither figure sports a halo. Where did you find this image, Gunnar? I'm interested. It's in the narthex of the church at the New Skete Monastery (OCA stavropegial). Dorothy Day and Mother Theresa are not Orthodox, and should not be painted within the nave of an Orthodox church. Abp Michael Ramsey and Pope Paul VI are not Orthodox, and should not be painted within the nave of an Orthodox church. Sorry, I was confused. The first image--don't know where it's from. But the depictions of those other dudes in New Skete are in the narthex, not the nave, and predate it's reception into the Orthodox Church, from the time they were still Eastern Rite Franciscans. I remember reading the first image is from Crete or Cyprus. From an RC church? Why the Latin if in a Greek church? And why that image if on Crete or Cyprus--hardly outposts of ecumenism. It bumps inside my head it is in the (Orthodox) Archdiocese curia or some community centre belonging to it. I might be wrong, though. Wrong again. The Church of the Transfiguration was the original one, built in 1970, when they were still Byzantine Catholic. They became Orthodox in 1979. The Church of Holy Wisdom was built in 1983 and the iconography finished in 2002. The images are in the nave not the narthex. This is a wonderful and inspiring icon. This is what I hope for. It is not an icon. It is, at best, wishful thinking; at worst, ecclesiopolitical propaganda. At any rate, it is completely unsuitable for veneration. I make no apologies for my position. Crete was for centuries under Venetian rule; Cyprus was first occupied by the Crusaders, and later ruled by Venice. The iconography and devotional practices of both regions soon became heavily influenced by western forms. I can't say anything for sure, but I have heard it hangs inside the Phanar. Do no say that you are giving me a heart attack!!! They should paint a new image, or at least cover up the non-Orthodox figures. That way the icon would be less schlocky. What that history has to do with a modern commemorative painting of a modern event? I was answering the statement of Crete or Cyprus being "hardly outposts of ecumenism". 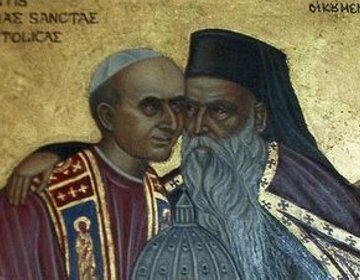 Just to be clear, I believe it is Pope Paul VI on the left and Patriarch Athenagorus on the right. I think I could argue about the veneration thing but perhaps after Easter (and if I am in the mood for getting browbeaten). Let us leave it as an instructional icon. They sowed the seeds that I hope we will continue to water and nurture such that some day rift in the Church will end. Opus, you're still missing the point. The appropriation of iconography to promote a cause, be it political, social or ecclesiopolitical, even if that cause is a "good" one, is a shameful debasement of what iconography is and stands for. We have seen such images a number of times on this thread, images which are simply vehicles for this or that cause. None of them are acceptable, even as didactic images. It is a commerative image of an historical event not an icon. It would have been preferable to paint the event in a more conventional, naturalistic style, to clearly distinguish the event as an earthly encounter in time. The use of the abstracted, non-naturalistic, timeless iconographic style, and using the motif of the brotherly embrace and their joint holding a model of a church, one which is seen in icons of Apostles Peter and Paul, only serves to confuse people. From my last trip to Romania and a parish consecration. That's Metropolitan Teofan of Iaşi, who is very much alive and looks, in this fresco, very 'iconic.' All over Romania, there were paintings of bishops, princes, and even a Sultan, right up there on the back walls of churches next to the saints. It is one thing to have a conventional portrait of a living hierarch in a church office or parish hall. There is also a convention of painting "iconographic portraits" (without haloes, without the appellation "Saint" of departed holy people who may well be glorified as saints in the future. However, the placing of a portrait painted in an iconographic style of a living person within the nave of a church, surrounded by proclaimed saints, is not right. Really? Due to shock and surprise? Art forms don't really mean ecumenism. I meant that if the pope and patriarch were to meet in Cyprus or Crete, there would be large protests. I thought it was more naturalistic than iconographic and they did exchange the brotherly embrace, not sure how differently that could be represented. Also not sure what both of them holding a model of St Peter's Basilica is to represent as neither founded or funded a church which is what the model church is used to represent. The motif of them jointly holding a church is clearly speaking of church unity. The image is appropriating established and well-understood iconographic imagery to make an ecclesiopolitical statement in the guise of an "icon". The gold-leaf background and lettered inscriptions further attest to the "iconographic" intent of the image, giving the lie to it being simply a conventional painting. "Through less than diligent episcopal oversight" is the most charitable way I can express it. Says it all, really. The bulk of McNichols' work is no less egregious and blasphemous than Lentz's. McNichols has not only painted an "icon" of a declared heretic, but seems to be unaware that Origen was an avowed iconoclast. Oh, the irony! Is Origen an anathematized heretic, or merely some of his ideas were rejected by the Orthodox? In the West, in the Anglican and Catholic tradition, I've never seen him equated with somebody like Arius- in fact his theology is often referenced as typical of the early Alexandrian tradition. People mistake their own wishes and desires with holy thoughts. When the bishop will not act, it is time for the babushki to intervene. See the Fifth Ecumenical Council, accepted also by the West. The Fifth Ecumenical Council condemned Origen, Didymus, and Evagrius for teaching the pre-existence of souls, reincarnation, the ultimate salvation of demons, that heavenly bodies possessed souls, and other errors. Accepted by Roman Catholics perhaps... it is a very old tradition that Anglicans usually only look to the first four as guidance. Still, I haven't heard many Catholics denounce Origen completely, merely some of his theology not gaining acceptance. On an unrelated note... The pictures of the interior of St. Gregory of Nyssa (the Episcopalian church in San Francisco) were shocking, especially Malcom X being depicted as a saint. The pictures of the interior of St. Gregory of Nyssa (the Episcopalian church in San Francisco) were shocking, especially Malcom X being depicted as a saint. Oh, there's so much "iconographic" schlock in that church, I could write a reasonable-sized book on it. AFAIR, he visited Cyprus. And Greece. But were pope and patriarch together? He met there Primates of the Churches of Cyprus and Greece. As I recall there were protests. What are people's opinions on icons of St. Constantine that depict him with a beard? Could you possibly be confusing this image with the icon of Sts. Peter and Andrew embracing, commissioned by, IIRC, Pope Paul for Pat. Athenagoras, at the time of the lifting of the anathemas? Not sure people's opinions are of much worth. Married and monastic saints are depicted with beards, whether they actually had them or not, unless they were eunuchs (sometimes). So, while for example St. Demetrius of Thessaloniki or more certainly St. John the Russian were 36 and 40 at the time of their deaths and St. John likely had a beard I would think, they are depicted as beardless in icons because they were unmarried. Sometimes icons of them make them look like they're 18.